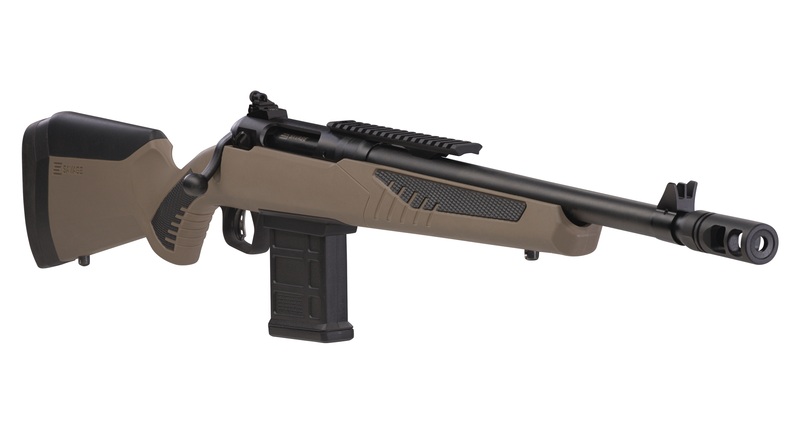 WESTFIELD, Massachusetts - May 11, 2018 - The new form-fitting, high-performance Model 110 Scout rifle from Savage allows shooters to make fast, accurate shots from a variety of positions—including offhand. Shipments of these firearms are currently being delivered to dealers. The Savage 110 Scout’s AccuFit system lets shooters easily customize the length-of-pull and comb height for a personalized fit, while the user-adjustable AccuTrigger offers a crisp, clean pull. Together with the AccuStock, which secures the action three-dimensionally along its entire length, the 110 Scout provides the fit and function of a custom rifle—right out of the box. It’s also flush with features, including a carbon steel barrel, muzzle brake and AICS-style detachable box magazine that holds 10 rounds. Plus, its rugged synthetic stock, forward mounted rail and adjustable iron sights are perfectly suited to the versatile platform.